With heavy hearts, the WGC immersion trip team is preparing to say goodbye to Chimbote, Peru. Our taste palates have been forever spoiled by all the AMAZING Peruvian dishes we’ve enjoyed: fresh ceviche, fried yucca, papas a la huancaina, pollo a la plancha, fresh fruit smoothies, the coveted and spicy ahi sauce – oh! – we could go on and on!! Then, of course, there are the people. On Thursday, we were honored to visit Tierra Prometida (“Promised Land”) preschool just outside of Chimbote. WGC’s Early Childhood Program provides training for its teachers and we support the school in other meaningful ways. Between 8 and 15 children (it varies daily), ages 4 and 5, attend this tiny, one-room school situated in the middle of one of the Peruvian desert’s poorest areas. It’s on the outskirts of Nuevo Chimbote, and the entire residential zone – resembling the colonias on the Mexico-U.S. border – lacks basic services such as running water. Homes consist of used plywood or crude bricks. Roofs are almost always made from large thatched grass mats, since it rains less than three times a year. Tanya is the primary teacher here, and she and her supervisor Angelita hosted our group for the day. We loved that they asked us to help out in the classroom, from participating in games on the playground (a sand-and-gravel lot), teaching the kids the colors in English and overseeing an art project where the kids painted a Christmas tree to hang in the room. Angelita explained that the students represent a tiny slice of the overall preschool population in the area, but most parents find it difficult and costly to send their kids because they must pay for their own school supplies and lunches. The government-sponsored school is run on a shoestring budget, with Tanya almost working for free. But you can see that money is no object in her care for the kids – they adore her and respond so well to the routines she lovingly sets up in the classroom. There seems to be a fun song for every transition – from cleaning up to eating lunch to washing their hands in the bowl of water serving as the “sink.” The games she leads outdoors emphasize taking turns and counting. And Tanya knows the personalities of each child – how Alvaro has a hard time staying in his seat yet loves attention, how Jason’s moods mask his intelligent sensitivity, and how Cielo likes to spend most of her time in the pretend station “dressing” the red-haired baby doll in towels and rags. Tessa Cornally, an Incarnate Word missionary in Peru for WGC, is working in Nuevo Chimbote and at the Tierra Prometida school during her 2-year term. As a volunteer with Sembrano Infancia – an early childhood nutrition and development program started and supported by the Sisters of Charity of the Incarnate Word – Tessa will help begin a new project aimed at promoting child health and parent education. The goal is to raise health and development literacy in the community while training local promotoras to advocate for better and more consistent health and public services. We will soon leave each of the three IWM missionaries — Ada, Tessa, and Jackie — and hope they know just how many of us are lifting them up in love and prayer! The WGC Early Childhood Education workshop took place on Tuesday, December 10th in the Centenario Cultural Center in Chimbote. The group was comprised of 11 participants from the Nuevo Chimbote area, three coordinators and eight preschool teachers. The session was opened by Julia Hidalgo Vega, the director of the Santa Clara Clinic in Chimbote. She welcomed the WGC group and introduced Lisa Uribe, WGC Executive director, who facilitated the workshop with Tessa Cornally, IWM Missionary. The day was composed of a mixture of presentations and interactive activities with the teachers. The first session explained the different stages of Piaget’s cognitive development for children from birth to 12 years of age. The use of videos seemed to help the teachers really visualize the different stages of development. The second session stressed the need that children need play and how developing children’s social skills plays a very important part in the preschool classroom. This sparked a discussion of how important the parent’s role is also in the child’s development and how they can work with the parents in the community. The last session, after the morning break, focused on themes for project focused teaching. The teachers were asked to brainstorm different themes, and show how they would initiate them and put them into practice in their own classroom. The teachers got quite creative with the different themes and put their work up around the room. These themes were then mirrored by photos of classrooms in preschools in San Antonio and to see how the classroom can be organized to facilitate the preschool teacher’s work plan. The day closed with a feedback session and lunch of rice, vegetables and chicken outside for all the participants under the shining sun! IWM Missionary, Tessa Cornally, will be in contact with these teachers over the coming months to develop these skills more and provide support with the Programme “Sembrando Infancia” from the Santa Clara Clinic. Preschool Teacher Training in Nuevo Chimbote! The preschool teachers and coordinators from Nuevo Chimbote with their certificates upon completion of the day course today entitled “Los ninos aprenden a medida que crecen” — with Nicole Foy and 4 others at Centro Cultural Centenario de Chimbote – PERÚ. The WGC team has wrapped up workshops with Pushaq Warmi and today we move to the part of the trip focused on furthering our early childhood teacher training program in Chimbote. Wi-Fi connections have been so spotty that posting regularly has been challenging — so this update will encompass the past few days. During the marketing and branding workshops that WGC Associate Director Nicole Foy conducted, the women of Pushaq Warmi gave moving testimonies on their passion for leadership. They shared about their dream to reach out to other women who are marginalized or are victims of violence in Peru. Pushaq Warmi will work over the next several months with Incarnate Word missionary Ada Garza, who is in Chimbote for a two-year term, on actual realization of their business brand and logo. She will also work alongside the women in implementing their business and marketing plans while scaling up sales and their presence on Facebook. After helping lead our exciting action day perfecting bakery products in the kitchen, WGC volunteer Anne Catherine Mora concluded her workshop sessions by focusing on nutrition. She explained the science behind how our bodies respond to healthy foods versus how they react to toxins in food and our environment. The women of Pushaq Warmi enjoyed learning about “The Golden Rules of Nutrition” – rules they will use in continuing to perfect the healthy, natural baked goods for their business. There are many products and organic foods available in Peru that contribute to health, so there is no need to use unnatural ingredients, Anne Catherine noted. Pushaq Warmi leaders said that since artificial preservatives will not be used, they continue to work on matching demand with product shelf life. Finally, in a special ceremony at the local cultural center and library, the WGC team presented each of the women with certificates of completion for each of the workshops we conducted. We kissed and hugged our goodbyes, knowing that we will forever hold our shared experiences and love for one another in our hearts. Today, we put ideas into action! Creativity reigned supreme in the kitchen, where members of Pushaq Warmi, under the tutelage of WGC’s very passionate volunteer Anne Catherine Mora, spent about six hours trying out new recipes for breads, muffins and cake pops. The treats could become products in their developing collective bakery business here. A lively group of about 18 women from Pushaq Warmi and Women’s Global Connection worked in Rosalia Huertas Merino’s home in Nuevo Chimbote to learn from Anne Catherine about healthy baking practices. Anne, who lives in San Antonio, is a world traveler who has resided in countless countries and loves to tackle all kinds of cuisines in her kitchen. 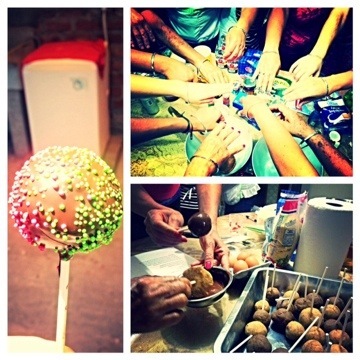 We had great fun making cake pops, which are tiny cake morsels on sticks that are dipped in chocolate and decorated. They are all the rage in the United States, and the women here are eager to introduce the trend in Peru to generate interest and income. Everyone agreed that one of the best breads produced today came from the healthy and indigenous quinoa grain. Anne Catherine showed how adding bananas, or platanos, made the loaves extra moist and delicious, with no need for artificial or unhealthy sweeteners. This is in line with Pushaq Warmi’s business plan of offering healthy snack and treat alternatives in their town of Chimbote, where panaderias are common but using all-natural and healthy ingredients is not the norm. Some of the next steps will be for the women of Pushaq Warmi to determine what it will cost them to make their desired products and how much they will need to charge to make a profit. Yesterday they shared their business plan with us, where they have identified their target market and made projections on sales and storefront development. They also provided us with approximate costs of some infrastructure and supplies. WGC will use this information immediately to help apply for grant funding in San Antonio for business startup microfinancing for Pushaq Warmi’s baking business. The grant application is due before the end of the year. Of course no day of baking and tasting is complete without dancing and yoga!! As we waited for the dough to rise and during breaks, we moved furniture in the living room and danced to lively salsa music! It was certainly a day full of joy, sharing, and fun for all! The WGC team is now fully on the ground in Chimbote! Our partners with Pushaq Warmi surprised us with a mini serenade outside our hotel, complete with lovely gifts of roses. The streets have been alive w revelry, as Chimbote is celebrating its 107th birthday as a city with a multi-day fiesta. We had dinner together then visited w Maribel, a member of Pushaq Warmi who runs a kiosk tiendita in the city center. Earlier in the day, Sandra and Ruth, of PW also, interviewed us about our work and projects on their radio show. This dynamic duo uses their weekly spot to honestly communicate issues facing women in Peru. The topic they tackled yesterday was maintaining confidentiality around personal health conditions such as HIV/AIDS and how to fight discrimination that can occur after one is diagnosed as HIV positive. Today we are holding team planning sessions around the weekend workshops we will hold about production and marketing of the women’s developing collective bakery business. We have arrived in Chimbote after a very tired/giddy/silly midnight start to a 7-hour bus trip. The bus was so comfortable, (the road not so much) with recliners and a nice dark cabin. Sister Juanita tells us the buses used to stop at other smaller towns along the way, but there were many robberies, so that was stopped. So our first visit in Chimbote was the Incarnate Word sisters’ house (attached to the back of a medical clinic supported by Christus Santa Rosa) for a special blessing in their lovely garden, followed by a yummy lunch. Looking forward to meeting today with the women’s group we help support, Pushaq Warmi, meaning Guiding Women! We sent off Executive Director Lisa Uribe, Assoc. Director Nicole Foy, and Volunteer Extraordinaire (our volunteers are extraordinary!) for 2 weeks of service in Chimbote.